[Piotr] was working on a recent Arduino project when he ran into a problem. He was having trouble getting his Arduino Pro Mini to communicate with an ESP8266 module. He needed a way to snoop on the back and forth serial communications. Since he didn’t have a specialized tool for this task, [Piotr] ended up building his own. The setup is pretty simple. You start with a standard serial cable containing the TX, RX, DTR, and GND wires. This cable connects the Arduino to the ESP8266 WiFi module. The TX and RX lines are then tapped into. Each wire is routed to the RX pin of two different serial to USB adapters. This way, the data being sent from the Arduino shows up on one COM port and the data being transmitted from the module shows up on the other. The next piece of the puzzle was coming up with a way to see the data more clearly. [Piotr] could have opened two serial terminals simultaneously, but this wasn’t ideal because it would be difficult to compare the timing of the data. Instead, [Piotr] spent less than an hour writing his own simple serial terminal. This one connects to two COM ports at the same time and prints the data on the same screen. 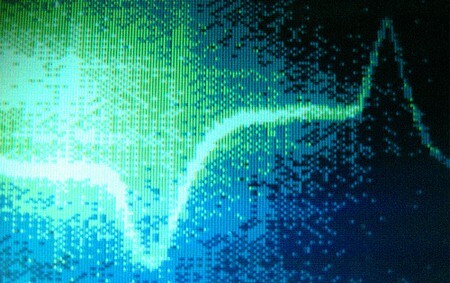 The data from each COM port is displayed in a separate color to make it easy to differentiate. The schematic and source code to this project can be found on [Piotr’s] website. Most tech savvy individuals are well aware of the vast amounts of data that social networking companies collect on us. Some take steps to avoid this data collection, others consider it a trade-off for using free tools to stay in touch with friends and family. Sometimes these ads can get a bit… creepy. Have you ever noticed an ad in the sidebar and thought to yourself, “I just searched for that…” It can be rather unsettling. [Brian] was looking for ways to get back at his new roommate in retaliation of prank that was pulled at [Brian’s] expense. [Brian] is no novice to Internet marketing. One day, he realized that he could create a Facebook ad group with only one member. Playing off of his roommate’s natural paranoia, he decided to serve up some of the most eerily targeted Facebook ads ever seen. Creating extremely targeted ads without giving away the prank is trickier than you might think. The ad can’t be targeted solely for one person. It needs to be targeted to something that seems like a legitimate niche market, albeit a strange one. [Brian’s] roommate happens to be a professional sword swallower (seriously). 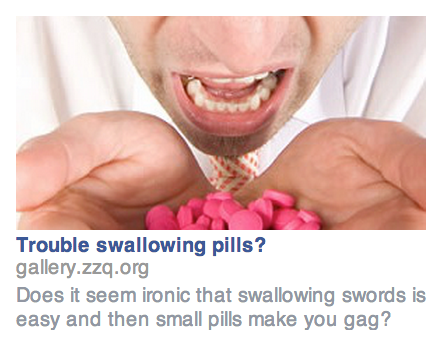 He also happens to ironically have a difficult time swallowing pills. naturally, [Brian] created an ad directed specifically towards that market. The roommate thought this was a bit creepy, but mostly humorous. Slowly over the course of three weeks, [Brian] served more and more ads. Each one was more targeted than the last. He almost gave himself away at one point, but he managed to salvage the prank. Meanwhile, the roommate grew more and more paranoid. He started to think that perhaps Facebook was actually listening in on his phone calls. How else could they have received some of this information? As a happy coincidence, all of this happened at the same time as the [Edward Snowden] leaks. Not only was the roommate now concerned about Facebook’s snooping, but he also had the NSA to worry about. This prank brings up some interesting social questions. [Brian’s] roommate seemed to actually start believing that Facebook might be listening in on his personal calls for the purposes of better ad targeting. How many other people would believe the same thing? Is it really that far-fetched to think that these companies might move in this direction? If we found out they were already doing this type of snooping, would it really come as a shock to us?